Getting a visa for Cambodia ‘The Kingdom of Wonder’ is one of the most straightforward immigration processes we’ve experienced so far when travelling. UK citizens and many other nationalities can get a 30-day Cambodia visa on arrival (VOA). It should be noted that some ASEAN nationalities are exempt from needing a Cambodia visa for a specified number of days; whilst some nationalities aren’t eligible for a VOA and have to obtain one in advance. More detail can be found on the Royal Embassy of Cambodia website. Each time we’ve visited Cambodia we’ve gotten a VOA, so this post is based on those experiences, validated with up-to-date information from the Royal Embassy of Cambodia. 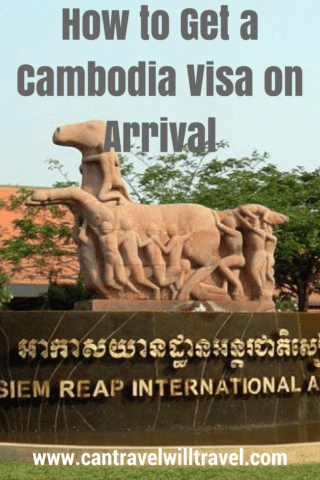 A Cambodia VOA can be obtained on arrival at Siem Reap or Phnom Penh International Airports or at a number of land-border crossings between Cambodia and Thailand, Laos, and Vietnam, the exact checkpoints are in the Royal Embassy of Cambodia Visa FAQs. 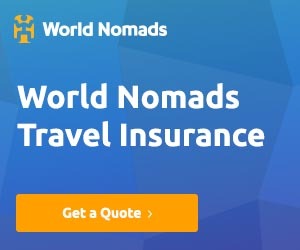 The single entry Cambodia Tourist visa (T-class) costs $30 (£23.30), is valid for 30 days and can be renewed once for a further 30 days without leaving the country. 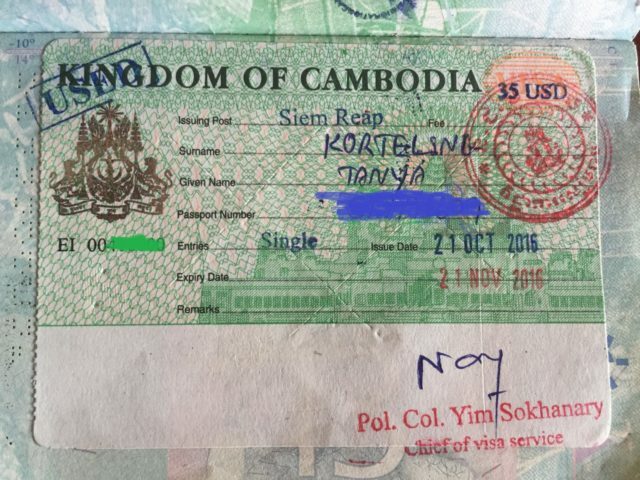 If you know you’ll be staying Cambodia for longer than 60 days, don’t get a tourist visa. A renewable Cambodia Ordinary visa (E-class) is a better option, also known as a business visa. This single entry visa costs $35 (£27.20) and is again valid for 30 days, after which you can extend it. A passport that is valid for six months or more. Two empty pages in your passport. A completed application form; supplied on the plane, or, at the airport or land border crossing. A passport photo, although if you don’t have one immigration will scan the one from your passport for a $2 (£1.43) fee. The visa fee as mentioned above. This must be in US dollars. The process for getting a visa on arrival before heading off to your hotel, hostel or guesthouse couldn’t be simpler. You just need to hand the immigration staff your completed Cambodia visa application form, passport, passport photo and visa fee. They’ll process your application in about five to ten minutes whilst you wait, then give your passport back. It will have the visa inside and you’ll be good to go. If you’re planning on staying for longer than two months be sure to double check your you’ve been given the correct visa. An Ordinary (E-Class) visa should have an eight digit number preceded with ‘EI’ on the left of the visa. There is a $10 (£7.70) per day charge if you overstay your Cambodia visa, which you’ll have to pay when you leave the country, you may also be charged for a visa extension, but this doesn’t always happen. It is permitted to overstay for up to 30 days; if you overstay for longer you’ll not only be liable for the $10 (£7.13) per day overstay charge, but you could also possibly be imprisoned, deported or face a ban on future travel to Cambodia. Tourist (T-Class) visas can be extended for one month without leaving the country, for subsequent renewals, you have to leave Cambodia and return in order to renew it. Ordinary (E-Class) visas can be extended for 1, 3, 6, or 12 months by getting one of the new set of four E-class visas introduced in 2017. The 1 and 3-month extensions are single entry and the 6 and 12-month extensions are multiple entry. Since September 4th 2017 the laws on long-term visa extensions have changed and work permits are now needed to renew the 6-month and 12-month Ordinary (E-Class) visas. The 1 and 3-month (single entry) extensions can, however, still be extended indefinitely. The Business2Business Cambodia website has more information on getting a long-term extension for a Cambodia Visa. They also have details on how to get work permits. Have you gotten your Cambodia visa in a different way to ‘on arrival’, maybe online or in advance? If so we’d love to hear how you did it in the comments below. 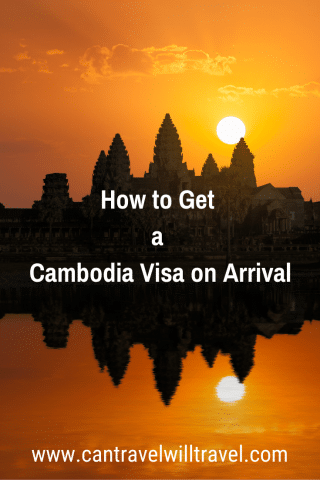 Disclaimer: Visa and work permit requirements for Cambodia are always subject to change, sometimes at short notice so be sure to double check requirements with your embassy before travelling to or relocating to Cambodia. These are the kind of posts I love! Thank you for the info!